Fall under the spell of the Mediterranean's key sites during an 8-day cruise offered by PONANT. With Athens as the departure point, board Le Bougainville for an unforgettable sailing experience discovering exceptional islands and cities. Your cruise will begin with the exploration of two of Greece's major sites, from Napflio: the Mycenae ruins and the Epidaurus theatre, both UNESCO World Heritage Sites. 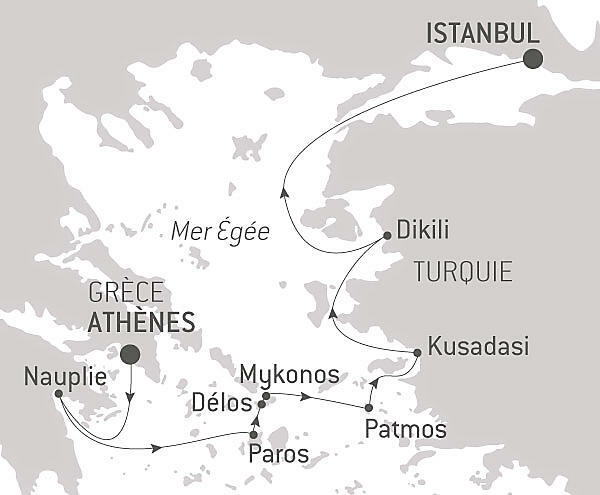 Following this port of call, Le Bougainville will leave Greece to reach Kusadasi, in Turkey. An old fishing village with history going back 5,000 years, not far from the Ephesus site, the town is now one of the country's most famous seaside resorts.